With all of their creamy goodness and adaptability, coconuts are an indispensable ingredient in many recipes, from smoothies and curries to cakes and salads. Moreover, they are an incredible superfood, providing essential nutrients and healthy fats in recipes that are naturally gluten-free and dairy-free. In The Whole Coconut Cookbook, this amazing fruit is celebrated in all its glory, from the familiar coconut water, coconut oil, and sugar, to creamy coconut milk and coconut aminos. These ingredients shine in delicious recipes like Coconut, Ginger, and Cilantro Mussels; Coconut Sesame Noodles with Baby Bok Choy and Tamarind Dressing; Spicy Coconut Chips; and Coconut Orange Cookies. 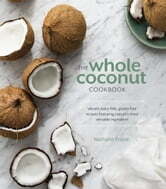 With a primer on the different parts of the fruit and a guide for using fresh coconuts at home, this beautiful book is perfect for anyone looking to incorporate this nutritional powerhouse into their every day home cooking.